Punch needle embroidery is a simple, fun, and fast fiber art that you can learn in an afternoon. In punch needle, you’ll use a special punch needle tool to punch loops of yarn into fabric to fill design areas with color. It’s like painting with yarn! If you want to try punch needle, keep reading for my top 10 tips for punch needle embroidery beginners. Punch needle is a craft technique suitable for all ages. Even my three-year-old was able to pick up the basics with a little coaching. 🙂 It’s one of the fastest types of needlework, and so satisfying. If you want to get started with punch needle embroidery, don’t miss Punch Needle Embroidery For Beginners. Ready to try Punch Needle embroidery? There are just a few tips and tricks you need to know! Here are my top ten tips for punch needle success. You can get started with punch needle right away. The required supplies are relatively inexpensive and small. You don’t need to invent a lot of time, money, or space to begin punch needle. 1. Use the correct fabric for your foundation. If you are punching with rug yarn, you’ll want to look for Monk’s Cloth fabric. Monk’s cloth 100% cotton fabric with a sturdy, yet flexible weave. Use monk’s cloths for your backing fabric when you’re making pillows, bags, stuffed objects, or even punch needle rugs. Monk’s cloth is available several sizes of weaves. For punch needle, you want a monk’s cloth with a tighter weave. For punch needle, choose a monk’s cloth with approximately 12 holes per inch. 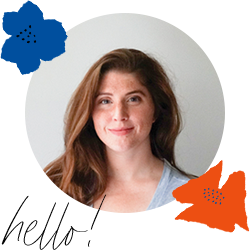 Be careful, because most craft stores — like Joann — carry a type of monk’s cloth with a much larger weave, usually 7 holes per inch. This type of monk’s cloth has a very open weave, which means your yarn won’t be held as tightly and may slip out. If you are punching with a fine needle and embroidery floss, you’ll want to use fabric like Weaver’s Cloth for your foundation fabric. Weaver’s Cloth is a poly-cotton blend with an even weave and a heavier weight. You can find Weaver’s Cloth online, and in the bottom-weight section of craft stores like Joann. 2. Use the right weight yarn. 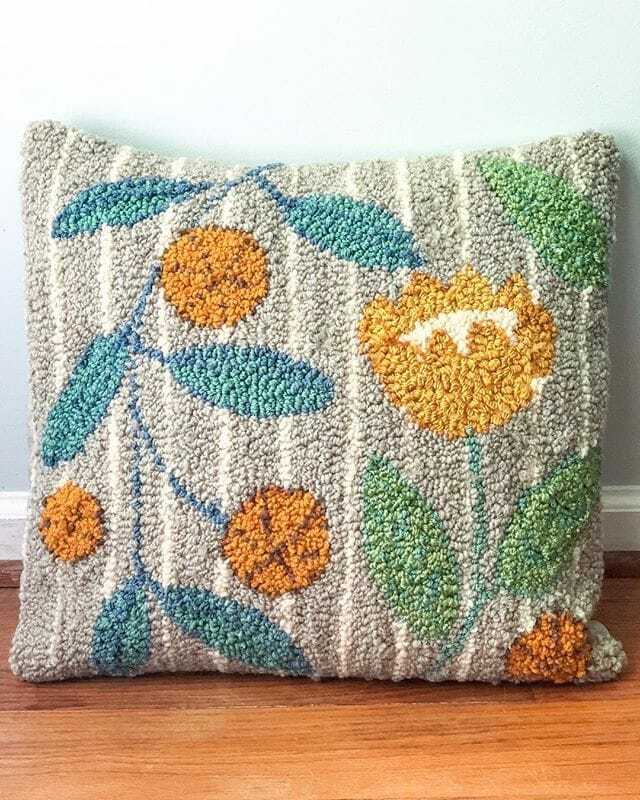 Use a size of yarn that is thin enough to flow easily through the punch needle tool, yet thick enough to stay in the holes of the foundation fabric. For use with the Amy Oxford punch needle, I recommend 3-ply rug yarn or bulky-weight knitting yarn. You can also use two strands of worsted-weight yarn held together, or even 3 or 4 strands of sock-weight yarn held together. For use a smaller gauge needle like the Ultra punch, you can use 6-strand embroidery floss, like DMC embroidery floss. 3. Use a proper frame to hold the fabric tight for punching. Basic wooden embroidery hoops can’t usually hold the fabric tight enough for punch needle embroidery. With each stitch, the fabric gets looser, and ends up making the whole process really frustrating. Instead, look for a heavy duty frame made for punch needle. Some of the best frames are gripper strip frames or Q-snap PVC embroidery frames. This is the exact frame that I use, and I really love it. If you’d like to use a hoop, I recommend a plastic no-slip hoop like the Morgan or Clover. You can also make a DIY carpet tack frame, or even use a staple gun to staple your backing fabric to a wooden frame. 4. Keep tight tension on the fabric. Always keep fabric drum-head tight (tight enough to bounce a coin on) so your needle can properly and neatly form stitches. 5. Keep loose tension on the yarn. This is a little tip, but it can make a big difference. Make sure that you have plenty of slack on the ball end of the yarn. Otherwise, any tension you have could pull your stitches out. 6. Pay attention to the direction of your needle when stitching. The open end of the needle faces the direction of stitches. In other words, the opening of the needle should always face the direction that you’re punching. Lead with the open side. 7. For even stitches, and thus even loops, punch down and at even depth. Punch the needle all the way down into the fabric until the wooden part of the handle is just touching the fabric. The length of the needle creates the depth of he loops. If you punch down to the same place on every stitch, then the loops will be a consistent pile height at the end. 8. Don’t lift the point of the needle off the surface of the fabric between stitches. Rather, just barely drag the tip of the punch needle across the surface. If you pull up too far, your loops will be uneven — or even worse, your loops will keep coming out. 9. Start with the outlines. Use smaller, closer stitches in the outlines than the fill stitches. Try for 6 stitches per inch for the outlines, and 4 stitches per inch to fill in the shapes. If you don’t like an area, you can pull your stitches back out. Go slow and be careful, so you don’t rip out too much. To fix any lingering punch marks in the monk’s cloth, run your fingernail over the fabric to close up the holes in the weave. Then, just try again! 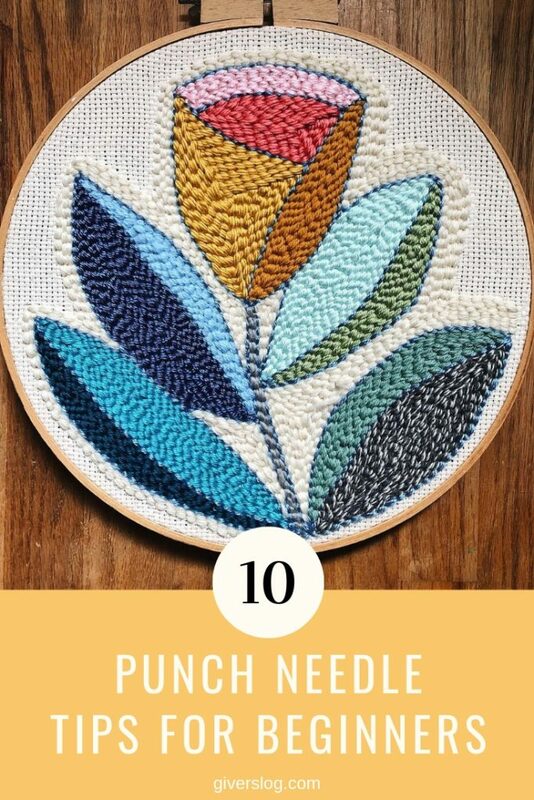 I hope these 10 punch needle embroidery tips are helpful to you! If you’d like to learn more, check out this comprehensive guide to Punch Needle Embroidery For Beginners. After that, take a look at The Best Punch Needle Kits and The Best Punch Needle Supplies. Where will I get the needle and thread? If I wanted to make a large rug- one that would be larger than the frame I’m using, how do i secure the edges that already have yarn in them? Is it possible to make a piece bigger than my frame without having large gaps showing the backing material? If you want to make a large rug, the best frame to use would be a gripper strip frame. That, or a diy carpet tack frame. Those types of frames will let you move your piece around.